home Security Coastal Security Better Chances for Survivors at Sea? Better Chances for Survivors at Sea? A maritime rescue device that could save lives during sea emergencies is being developed by the US Air Force Research Laboratory (AFRL). Although cruise ships and other seafaring vessels are required to carry more lifeboats than needed, these emergency vessels can potentially be rendered ineffective depending on the situation. For instance, if a ship is listing heavily to one side, the lifeboats on both sides may be difficult or impossible to deploy. This is why the US Coast Guard has been looking for a “lightweight, ultra-compact, easily-deployable raft” that would be capable of carrying large numbers of passengers for up to 24 hours. The researchers from the AFRL, a team of engineering students from Michigan Technological University and the Coast Guard are working together to design a compact, high-capacity rescue device that can be deployed quickly at sea. The device could be dropped from a helicopter and deployed for short-term use until rescue vessels could arrive on the scene, according to military.com. The goal is to design a device that would hold 100 people and weigh 100 pounds (45 kg) or less. 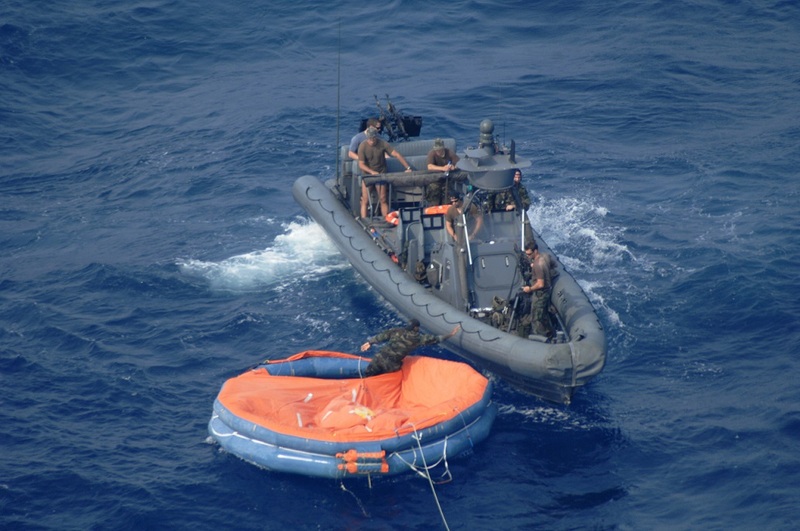 “Most of the current life rafts are designed to meet ‘safety of life at sea’ requirements. That requires rafts to have flares, extra safety equipment, and be capable of staying afloat for several weeks. With this effort, we just want to keep people out of the water until larger rescue crews can arrive,” said 2nd Lt. Elias Johnson, AFRL project manager. The development process is based on “using human-centered design principles to understand the needs of those stranded in the water, while also using our materials expertise to create a feasible solution,” he added, as reported by wpafb.af.mil. The brainstorming session included a special helicopter tour and interviews with helicopters pilots, crew members, and rescue swimmers. This up-close perspective helped the students understand how the project’s strict weight and space requirements were derived and to view ocean rescue situations from an operator’s perspective.